← Did You Know by Kenny Offenther and Colleen Austin????? New family-friendly activity, shuffleboard in Tampa FL. See Below. Shuffle: The Heights recently opened at 2612 N Tampa St. bringing the popular St. Pete Shuffleboard Club concept to Tampa Heights with four indoor shuffleboard courts and a refined concession stand. 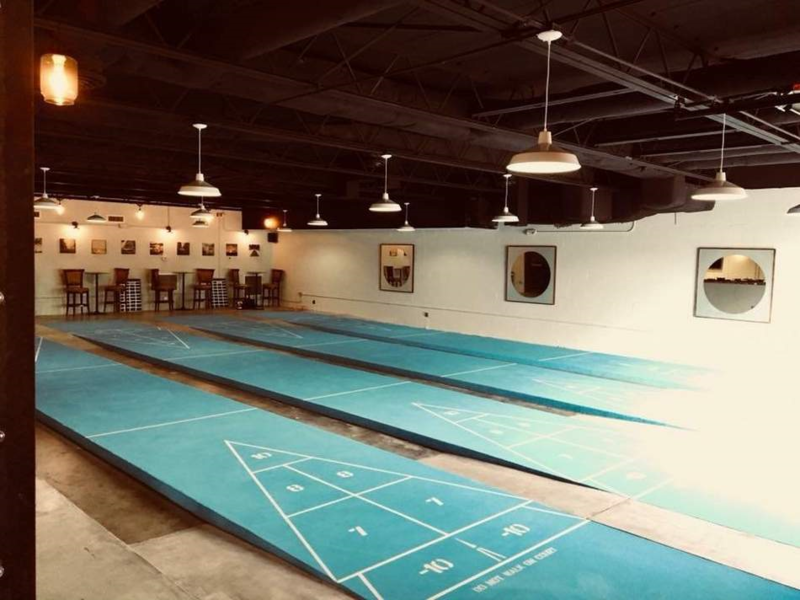 TAMPA HEIGHTS— Two single moms have come together to bring more allure to the Tampa Heights neighborhood with a new family-friendly activity, shuffleboard. Long-time friends and neighbors Jennifer Montgomery and Danielle O’Connor are both members of the historic and popular St. Pete Shuffleboard Club and realized Tampa did not have anything like it, so they opened a similar concept, Shuffle: The Heights. “Shuffleboard is very Floridaesque,” Montgomery said. “Everyone that has grown up in Florida remembers the courts at the beach in St. Pete, so the identity is here. Located at 2612 N Tampa St, the 4,700 square foot indoor facility has four, blue regulation size shuffleboard courts, two tabletop shuffleboards and a “glorified concession stand” offering vegan options, pizza, french fries, salads, corn dogs, candy, chips, hot dogs with gourmet toppings, popcorn and a curated selection of local craft beer and wine ranging $5-$10. Shuffle: The Heights held a number of soft openings this month including one on St. Patrick’s Day (Mar 17) and another major event on Easter (April 1) where DJ Wally Clark played WuTang sounds and guests enjoyed biscuits and gravy from the kitchen. In the future, Montgomery and O’Connor plan to add four outdoor courts as well, and have an official grand opening this summer. Prices are $10 per person, per hour, per court and generally games include four people but two or three people can play as well. Shuffle operates Tuesday through Thursday from 4 p.m. to 10 p.m., Friday and Saturday from 2 p.m. to midnight and Sunday 11 a.m. to 8 p.m., closed Mondays. For more information visit their Facebook page at facebook.com/tampashuffle/.